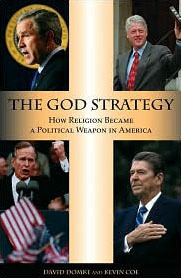 In The God Strategy , scholars David Domke and Kevin Coe offer a timely and dynamic study of the rise of religion in American politics, examining the public messages of political leaders over the past seventy-five years-from the 1932 election of Franklin Roosevelt to the early stages of the 2008 presidential race. They conclude that U.S. politics today is defined by a calculated, deliberate, and partisan use of faith that is unprecedented in modern politics. Sectarian influences and expressions of faith have always been part of American politics, the authors observe, but a profound change occurred beginning with the election of Ronald Reagan in 1980. What has developed since is a no-holds-barred religious politics that seeks to attract voters, identify and attack enemies, and solidify power. Domke and Coe identify a set of religious signals sent by both Republicans and Democrats in speeches, party platforms, proclamations, visits to audiences of faith, and even celebrations of Christmas. Sometimes these signals are intended for the eyes and ears of all Americans, and other times they are distinctly targeted to specific segments of the population. It's an approach that has been remarkably successful, utilized first and most extensively by the Republican Party to capture unprecedented power and then adopted by the Democratic Party, most notably by Bill Clinton in the 1990s and by a wide range of Democrats in the 2006 elections. "For U.S. politicians today, having faith isn't enough; it must be displayed, carefully and publicly. This is a stark transformation in recent decades," write Domke and Coe. With innovative, accessible research and analytical verve, they document how this has occurred, who has done it and why, and what it means for the American experiment in democracy. David Domke is Professor of Communication, University of Washington. A former journalist, he is the author of God Willing? : Political Fundamentalism in the White House, the "War on Terror," and the Echoing Press. Kevin Coe is a doctoral candidate in the Department of Speech Communication at the University of Illinois, Urbana-Champaign.